A few days later than I had hoped to get this post up, but here it is none the less. (In all honesty, I was swallowed whole for a few days by my latest nerdy investment in the amazing video game Red Dead Redemption, something I’m sure I’ll find time to talk about some time soon — if I can put it down long enough.) 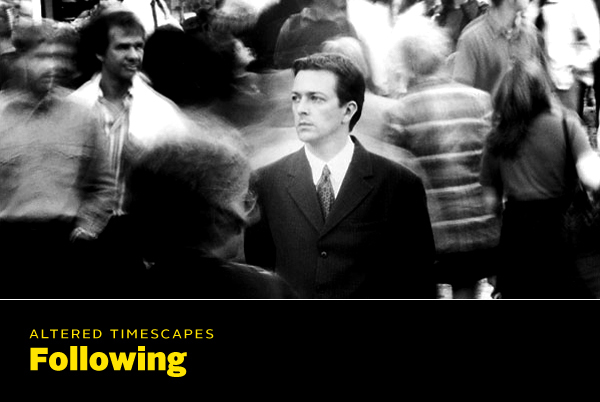 This is the inaugural entry of Altered Timescapes, my series of short reviews of the work of Christopher Nolan and, more specifically, the use of time as device within each film. First up is his debut film, Following. As with most of Nolan’s work, Following doesn’t “begin” at the beginning of the story that unfolds, but rather (approximately) half way through. This introduces us to the way time is used in the film, not only raising suspense and piquing curiosity but also testing the viewer’s perception and ability to know exactly what’s going on — a reflection of Bill, the protagonist, and the ultimate naivety of his involvement. If we were to use the opening scene as the marking post for what would be occurring “currently” in the movie, the film is constantly jumping between events before and after the initial scene while expanding upon it. The best way to follow the timeline and figure out just how things are happening chronologically is to pay close attention to the physical cues: hair and facial hair, clothing and Bill’s state of recovery from a scuffle all give clues to allow the viewer to put together the jigsaw-like construction of the film. Again, avoiding trying to sound like a legitimate critic I’ll keep it nice and brief. A delightful short noir that keeps the viewer a little confused but always curious. Ultimately it comes to a conclusion that brings all the pieces together but leaves you wanting to watch it again, perhaps to pick up on clues not witnessed with a single viewing. Recommended? You bet’cha. Next is his breakthrough piece Memento, which was my introduction to man celebrated in this series of reviews.